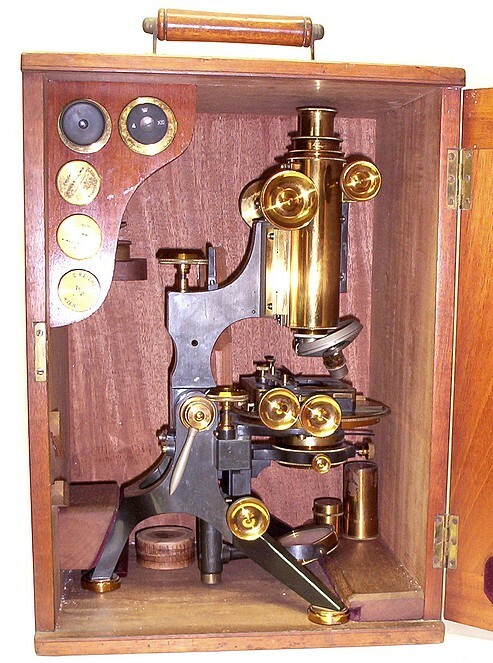 The Watson firm first manufactured this type of microscope in 1891 at the suggestion of the renowned Belgian microscopist Henri van Heurck (1838-1909). 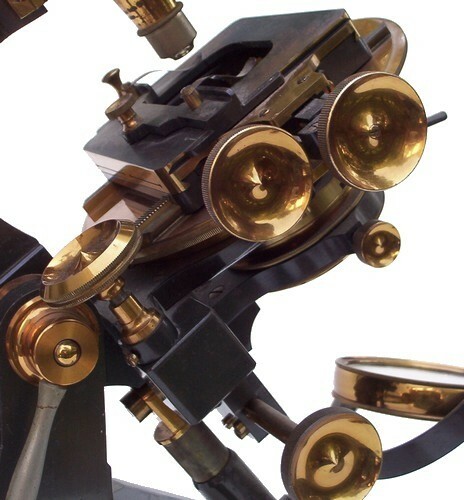 When first introduced, the microscope incorporated a continental (horseshoe) style base, but, as with the present example, stands with an English tripod base were also produced and these became the standard form. 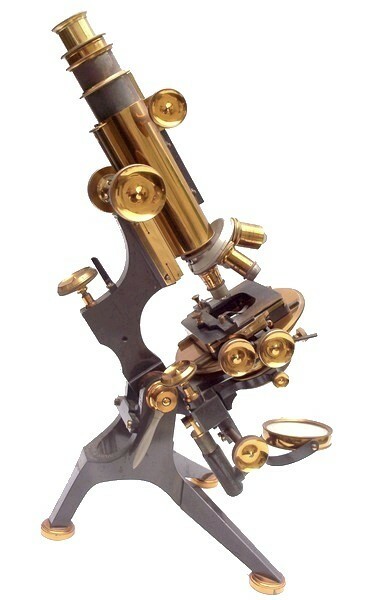 The microscope is constructed in brass with bright lacquered and oxidized surface finishes and is about 16 inches tall when set up for use with the draw tubes partially extended as shown in some of the photos. The main focus is by rack and pinion and the fine focus is by calibrated micrometer screw (1 rev, 1/13 mm). There is a rotatable mechanical stage and two drawtubes with the main drawtube calibrated and having movement by rack and pinion. 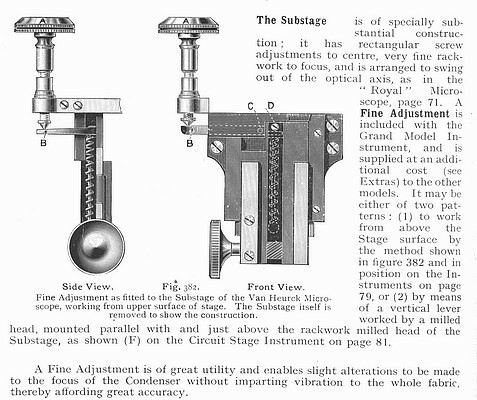 The substage is focused by rack and pinion, has a fine focus by micrometer screw located at the side of the stage, and has centering adjustments. 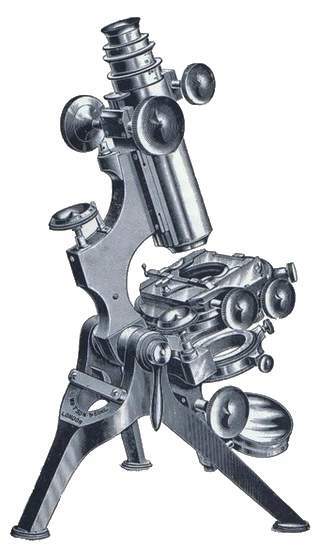 Read the description of the Watson Van Heurck microscope in the 1923 catalog. Elsewhere on this website is another example of the Watson Van Heurck No.1, serial number 10884, with a more elaborate stage having centering adjustments, calibrated stage movements, and rack and pinion stage rotation. 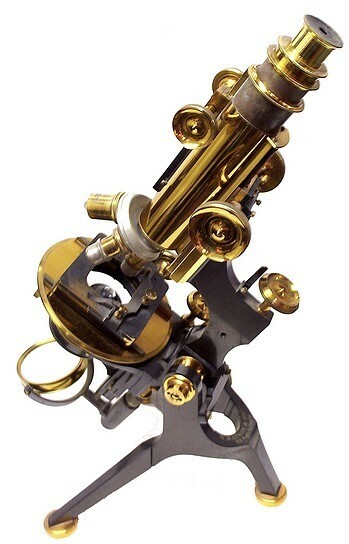 This microscope is based on the design of the Belgian botanist Henri Van Heurck (Antwerp 1839-1909).